The Division 1 college basketball championship tournament runs from March 13 through April 2 and everyone is getting into the excitement. From game viewings and battle of the brackets contests to local tournaments, there are happenings all around the world in celebration of the Big Dance. Come off the bench and get into the hoops action with these events taking place at or near military bases. 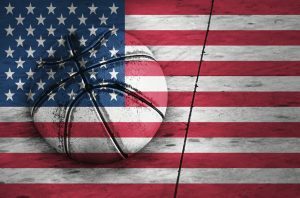 Get into the D1 college basketball championship action with these fun events happening at or near military bases around the world. Recreation Center, Fort Hunter Liggett Bldg. Stop by the recreation center to pick up your bracket and make your college basketball predictions for a chance to win a prize! Sign up no later than March 10. Military and civilians ages 14 and over can enter a team in the annual basketball tournament. Games will be played under NCAA rules and the top two teams will be awarded medals. Be part of the madness and join or watch the 3 on 3 Basketball Tournament. There will be 48 teams and 1 champion. Prizes for winners and giveaways and raffles for fans and participants. Visit Devers MSTC and view four college basketball games at the same time, plus enjoy food and contests. Dress to support your favorite team for a chance to win prizes. This 3 on 3 Basketball Tournament is presented by Youth Programs and any FSS/MWR eligible military/civilian dependent youth ages 13-18 years can play or watch. League is open to active duty, retirees, and NBSD ID cardholders. The Donate & Dunk 3-vs.-3 Basketball Tournament and the Three-Point Shooting Contest are part of the Army Emergency Relief campaign. This annual campaign raises money for the AER, a group that helps soldiers and their families during times of unforeseen financial distress. The greatest local and military basketball teams of the Pacific region battle it out for the title. The opening ceremony takes place on Saturday, March 17 at 9:30 am. The tournament runs until the March 24th championship game.